Gateway North Outfitters is owned and operated by Lucas & Nicole Adams. I (Lucas) have been working in the hunting and fishing business for the last 20+ years. It all started when my parents left Iowa and purchased an American plan fishing lodge located on Yoke Lake. I spent 6 years guiding and helping with the daily operations there. Then I followed them into the fly in outpost business (L&M Fly In) and worked with them for the next 15 years running the office and airbase, as well as doing lots of the maintenance and cabin remodeling. My wife Nikki (also from Iowa) joined us in the business in the spring of 1996 and has been working the business ever since. We purchased a small camp located on Off Lake in the spring of 2001 and started running our bear hunts and some deer hunts out of the cabins at this time, as well as overnight lodging for L&M Fly In guests. In the spring of 2004 we purchased our first outpost cabin, a boat in outpost located on Pipestone Lake. In the spring of 2006 we purchased two fly in outpost cabins located on Grant Lake and Dogfly Lake and continued working for L&M Fly In, as well as running our own operation. In January of 2007 we purchased another fly in outpost cabin on Kaminni Lake. In the spring of 2007, L&M Fly In decided to move their base of operations to Dryden, Ontario. At this time, we decided it was time to separate and let Gateway North Outfitters grow and get our fullest attention. The fall of 2009 we found ourselves purchasing another fly in outpost cabin on Sakwite Lake. We had been trying to purchase this outpost for years, and everything finally fell into place. This was a much needed addition as our guests were wanting something new and the demand for an excellent fly in walleye lake was incredible. The 2011 season we found ourselves purchasing and acquiring more BMA (Bear Management Areas) that adjoined our current areas. This was a great addition to give us more opportunities to better manage our area and handle a few more clients. Then later in the year we decided to purchase another fly in outpost cabin for the 2012 season. We purchased the Fishtrap Lake outpost cabin located next door to Sakwite. This lake offers more great smallmouth / walleye action. The 2013 season we decided to expand our fly in operation by purchasing a couple more outposts. We purchased Highrock Lake and Kinewan Lake. Both of these great locations are the only cabins on the lake and offer outstanding walleye / larger pike / abundant smallmouth bass. These lakes are right next door to Sakwite and Fishtrap Lake. We built a new cabin on Highrock Lake in the fall of 2014. This is a large deluxe outpost cabin with all the amenities. We strive for customer satisfaction and to make your trip one to remember. Your trip starts and ends with us and that is what separates us from everyone else. The people taking care of your vacation are the owners and care about your trip. We live in the area year round and enjoy the life that the business gives our family. We see our repeat guests as friends and look forward to meeting the new guests and sharing what we experience in the North country. We offer a trip for every season, so if you would like to experience something that we offer, feel free to contact us and see what we can do for you. 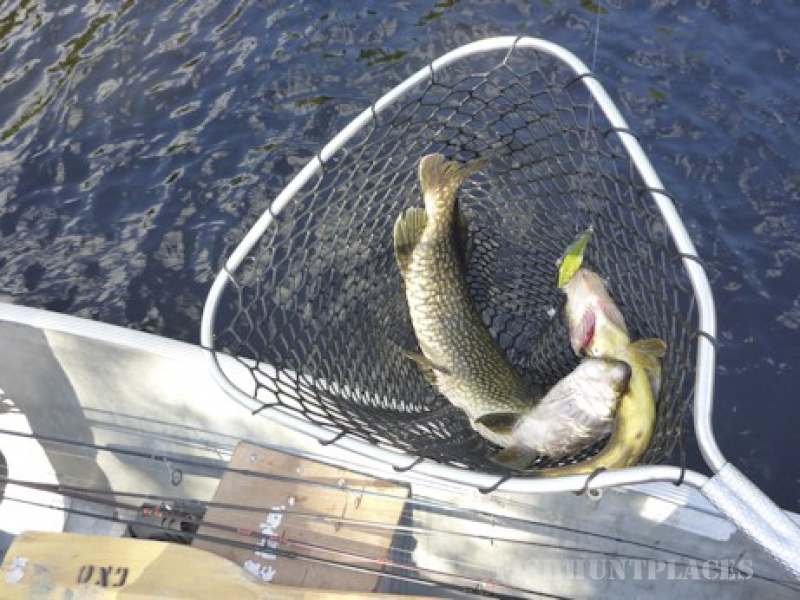 Excellent Ontario fishing with your own boat! This lake is as remote as you can get while fishing with your own boat. Pipestone is a truly unique waterway. Miles of unspoiled Canadian wilderness is yours to explore. Enjoy catching walleye, northern pike, smallmouth bass, largemouth bass, muskie, and lake trout in Ontario's Sunset Country. Fly in quality fishing without the flying. Our remote boat in outpost cabin is located in Watson Bay on breath taking Pipestone Lake. This remote cabin is reached after a scenic 20 mile boat ride. Pipestone Lake is accessed from Clearwater Lake, via mechanical rail portage. Pipestone Lake is over 25 miles long and offers access to additional fishing water without leaving your boat. There are countless bays, islands, reefs, and weed beds to explore while fishing for walleye, northern pike, muskie, lake trout, largemouth bass, & smallmouth bass. With all the varieties of fish available, you are sure to enjoy some excellent Canadian fishing memories. 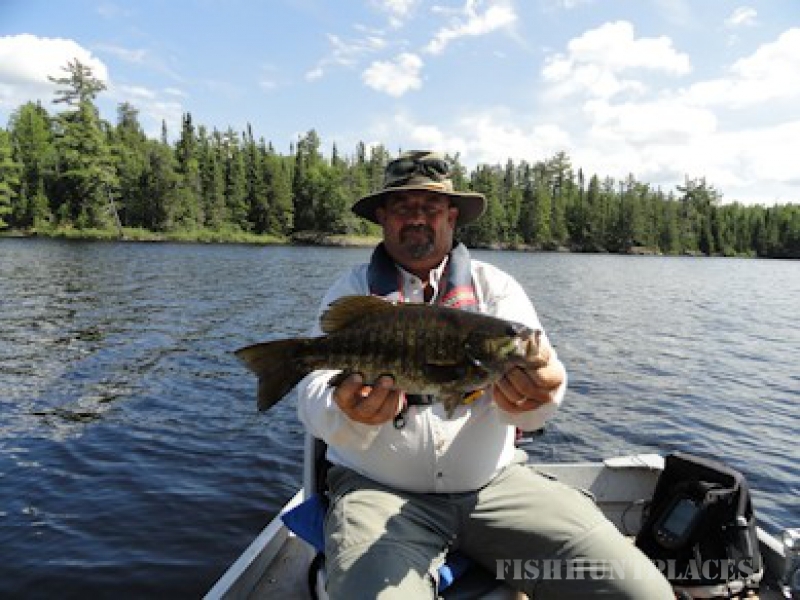 Pipestone Lake is most noted for it's excellent smallmouth bass fishing and trophy walleye. 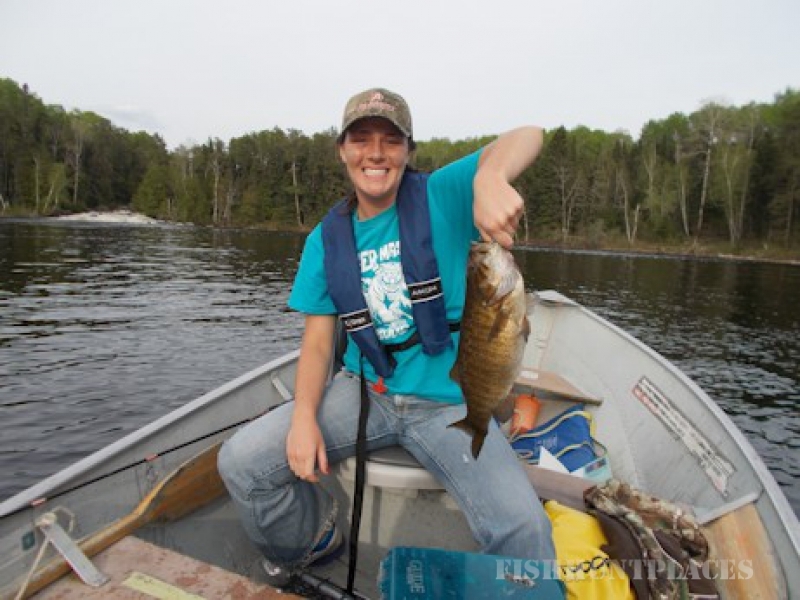 You can expect to catch & release lots of smallmouth bass in the 2-4# range. It is also noted for its BIG muskie, every year there are 55"+ fish caught & released. Typically July & August are excellent times of year for these monsters. Pipestone Lake offers some excellent spring and fall lake trout fishing. The trout run 5-8# on average with some fish topping 20# every year. 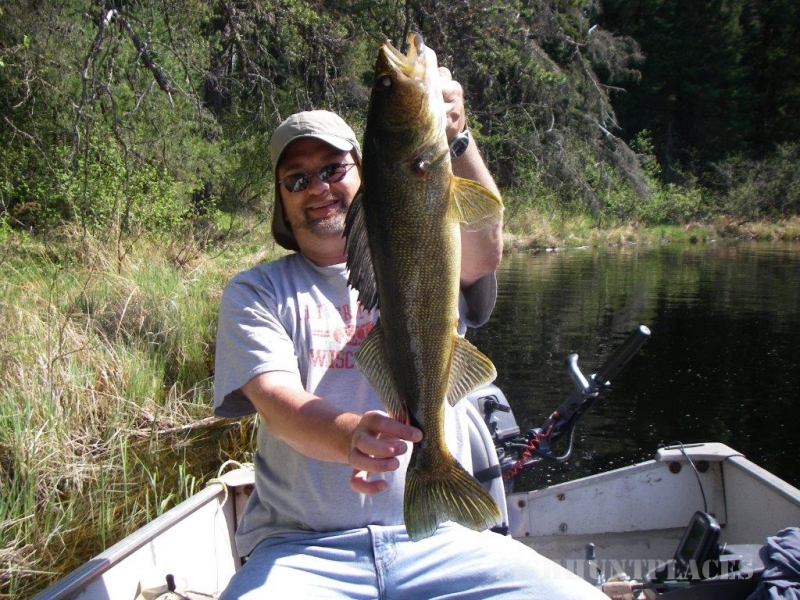 Pipestone Lake is also noted for its large walleyes. The walleye typically run 19-24" on average with lots of fish in the 27-31" range. You won't catch hundreds of walleyes in a day, but if you are after that Ontario trophy walleye, Pipestone Lake definitely has them. There are plenty of eater sized walleye too. 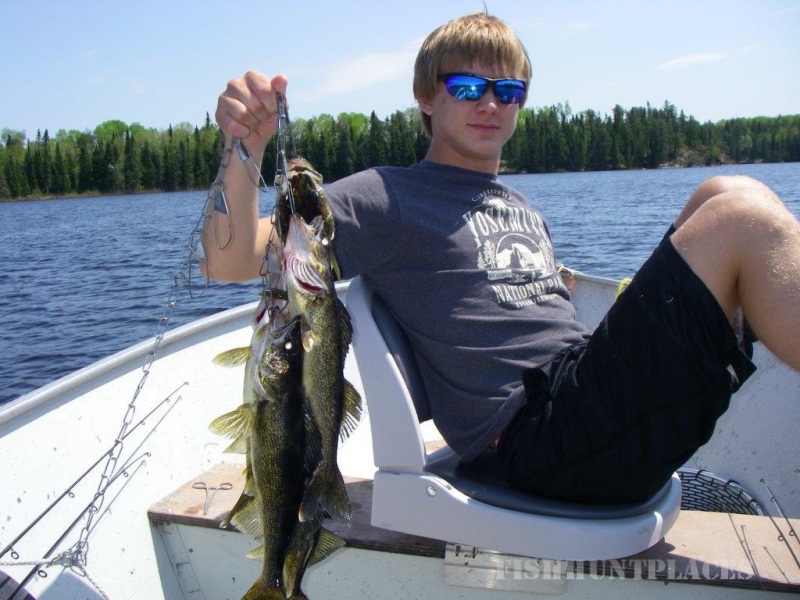 The walleye fishery is getting better and better every season and Pipestone rivals many fly in fishing lakes! 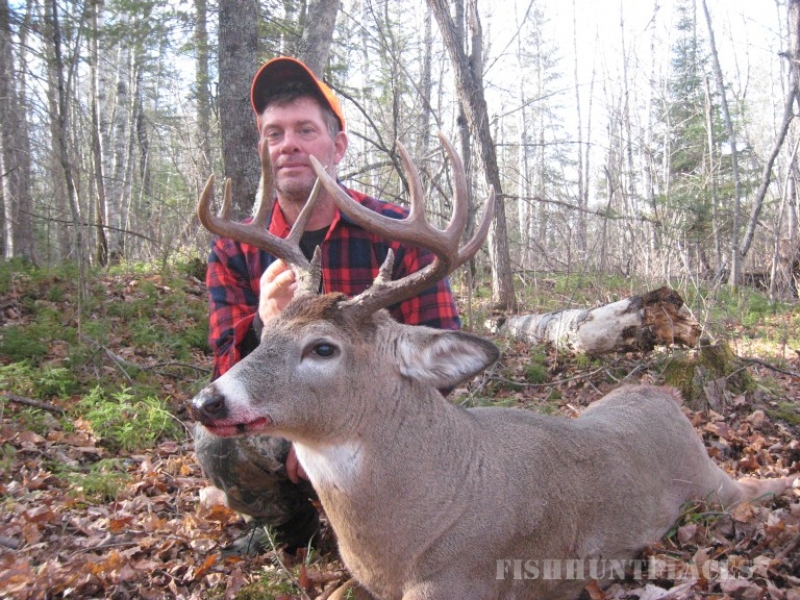 Trophy Canadian Whitetail Deer Hunts in Northwestern Ontario's Unspoiled Wilderness! 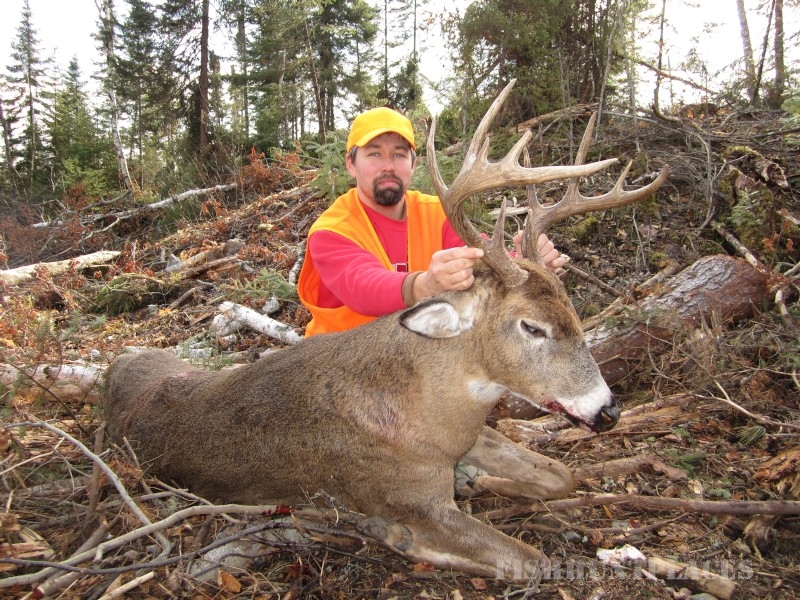 Our remote trophy whitetail deer hunts take place in Northwestern Ontario country off the logging roads in the area North of Fort Frances and South of Dryden, Ontario in the Rainy River district. This area of Ontario holds many entries in the record books. The areas we hunt vary from lakes, pine ridges, cedar swamps, spruce swamps, beaver ponds, and old growth clear cuts. 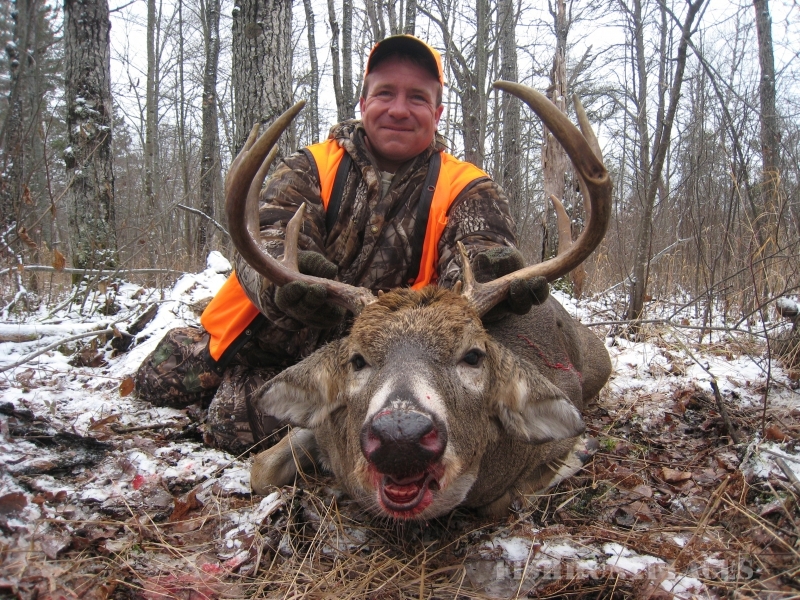 All hunts take place in NW Ontario's remote bush country with low hunting pressure and has excellent potential for trophy class bucks. In this remote bush country the deer are active throughout the day and are not as likely to move at night due to hunting pressure. The main method of hunting is sitting on stand. Ontario's whitetail deer are of large body size and carry heavy racks. The season also coincides with the pre rut and rut, even bettering your chance of success. 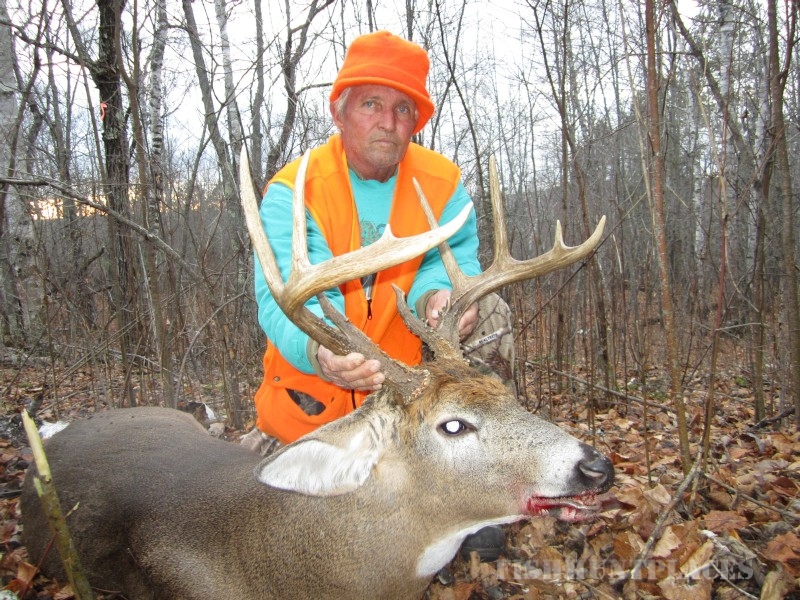 Due to the remoteness of the areas that we hunt and taking a limited number of hunters each year, your chances of bagging that Ontario trophy buck are very good. Our main focus is giving you a hunt of a lifetime and with a 70+% success rate, your sights are on target. On our earlier hunts, walking clear cuts can be very rewarding and offers a great opportunity for those who prefer still hunting and spot and stalk over stand hunting. 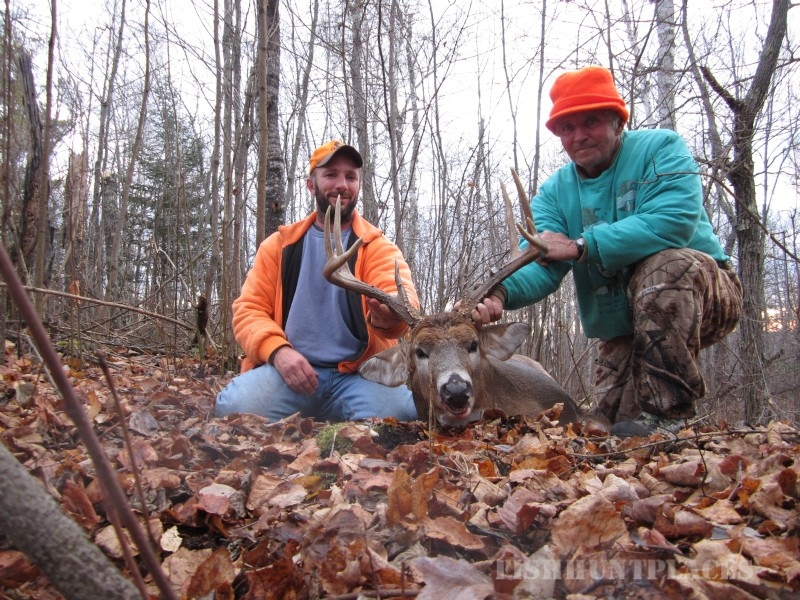 This a great way to cover a lot of ground and harvest a trophy buck on your terms in the Canadian Shield. If you are looking for a real Canadian Whitetail hunt of Western Canada standards at a fraction of the cost, give us a call. Come experience a true Canadian black bear hunt in Northwestern Ontario. 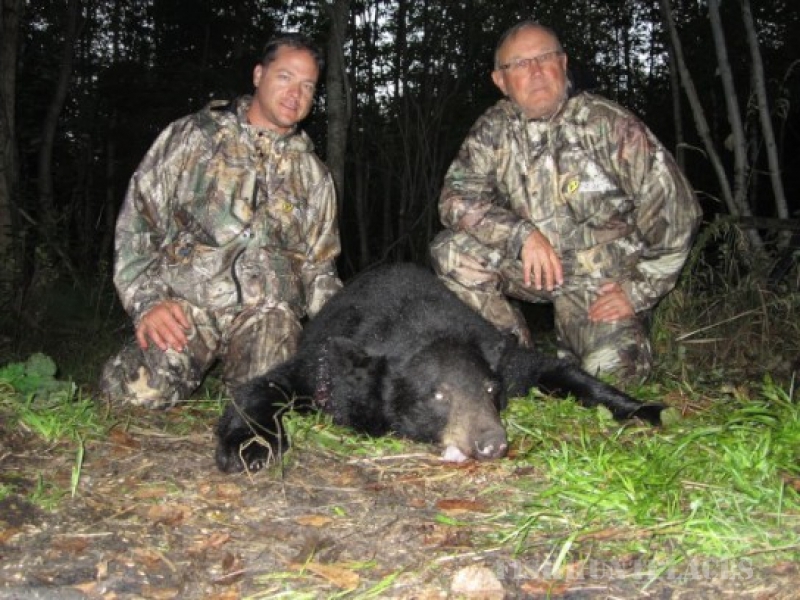 The black bears in our area of Northwestern Ontario are abundant and our success rate speaks for itself. We operate a first class hunt and you can be assured every effort is taken to give you the hunt of a lifetime. 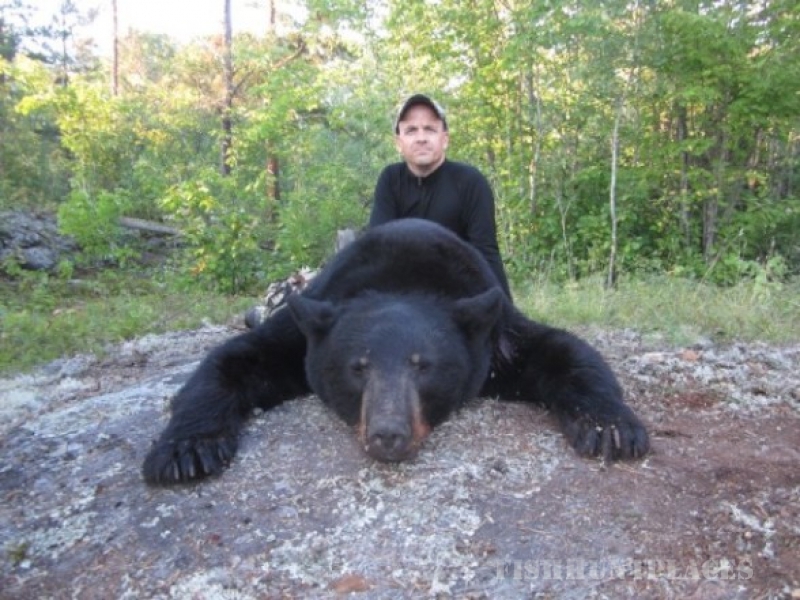 Book now to ensure your Ontario black bear hunt and you will not be disappointed! 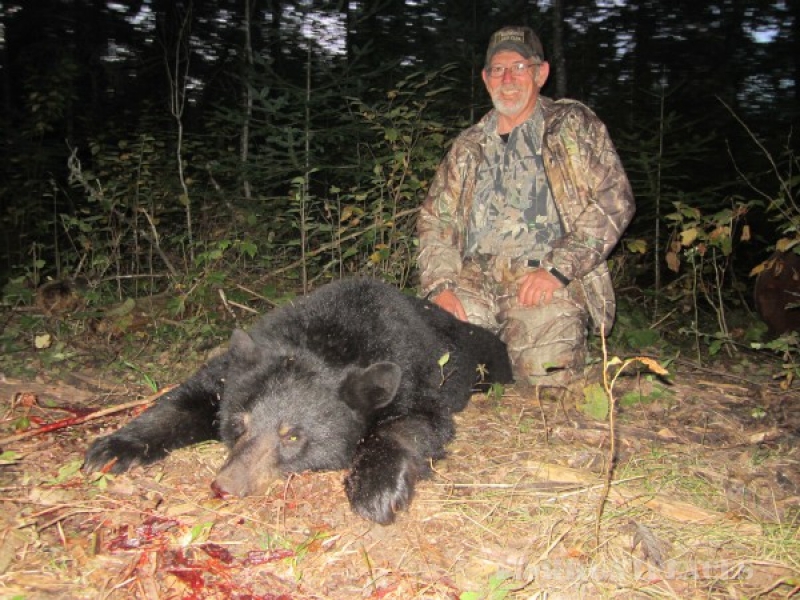 We offer a semi guided and fully guided high success drive in black bear hunt from our cabins on Off Lake. Our bear management area covers over 540 square miles of prime bear habitat. The size of our area increases your success with the numbers and quality of animals available. The method of hunting is sitting on stand at pre-baited sites. We utilize 55 gallon drums cabled to trees for holding the bait. This helps to ensure you get the shot on your trophy black bear. The bears roll the drums around to get the sweet feed out, helping you get the shot you need to harvest your trophy bear.The bait sites are accessed by old logging roads. We start the pre baiting about a month before the hunt starts to ensure your success. This, along with limiting the number of black bear hunts every year, and the high number of bears in our area, our hunters typically enjoy a 100% shot opportunity and success rates of 90-100% on our bear hunts. We offer fully guided moose hunts in wildlife management units 9B and 16A. We hunt out of remote fly in locations to help ensure your success. Hunting methods vary from spot and stalk, watching feeding areas, and calling, as the moose seasons in Ontario coincides with the rut. Hunting moose during the rut can be very exciting when these giants appear. This is sure to make your heart race and your trip all worth while. The moose in our hunting area typically have spreads of 35 - 50 inches, with a few pushing the 60 inch mark. We will make every effort to ensure your hunt is successful and enjoyable. We also offer non guided hunts for the more adventurous hunters. We have a limited number of moose tags available, so book early for your next Ontario hunting trip.